Condition:100% New. 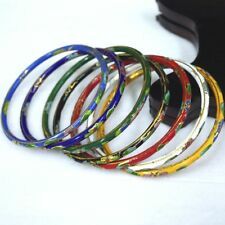 Gold Turquoise Blue Lacquer Enamel Coral Filigree Metal Bracelet Bangle Cuff. Suitable for the occasion:Party,Fashion Show,Photo,Wedding,Bridal,Prom.Fancy Dress and so on. Cuff Dia. :6cm (2.36"),Width:Max.6cm(2.36"),(1inch=2.54cm). Color:Vintage Gold and blue. Material:Gold Plated. Retail Price:69.99GBP. Package:1x Bracelet. Material :Copper 14K Gold. Flower pendant part length：2.36". Due to the light and screen difference, the item's color may be slightly different. It’ll take you one minute only. In particular, the combination of multi-process cloisonne is particularly prominent. Cloisonne special shape, exquisite production, solemn pattern, rich color, resplendent, with distinctive national characteristics, is China's traditional export crafts. Ethnic Jewel. We would love to hear about your experience. Product color may slightly vary due to photographic lighting source or your monitor settings. Weight: 30 Grams App. Ethnic Jewel. We would love to hear about your experience. Product color may slightly vary due to photographic lighting source or your monitor settings. Weight: 25 Grams App. Our manufacturers are SWAROVSKI verified producers, so we inlay real SWAROVSKI Crystals to make each item more brilliant & valuable. Only high quality raw materials used. Material:18k WhiteGold plated alloy(Lead Free& Nickel Free), Enam el. Local pickup is only available from Malvern, Vic. Our manufacturers are SWAROVSKI verified producers, so we inlay real SWAROVSKI Crystals to make each item more brilliant & valuable. Only high quality raw materials used. Local pickup is only available from Malvern, Vic. Our manufacturers are SWAROVSKI verified producers, so we inlay real SWAROVSKI Crystals to make each item more brilliant & valuable. Only high quality raw materials used. (Quality: AA Faux CZ. Screw Mount Open & close. No Change ). View photos as they say more than words.Though Photos don't do justice to item. 1 Crystal pink angel wing charm. 2 silver heart angel wings beads. Pandora Silver Leather chain. 2 large purple beads. 2 silver cross beads. GREAT FASHION PIECE GOOD FOR JEWELLERY COLLECTION. WE ARE MANUFACTURER OF ALL KIND OF SILVER GOLD & STONES JEWELLERY.”. SEE PHOTO FOR MORE DETAIL AND ACTUAL CONDITION. MONITOR BRIGHTNESS / CONTRAST SETTING ETC. 1 silver and blue heart lock and key charm. 1 silver and aqua tree charm. 1 silver aqua high heel shoe charm. 1 silver large snowflake charm. 1 silver castle charm. Silver Pandora heart chain. 1 Hello Kitty charm. 2 Silver crystal bow charms. We collect the folk fine art from China. 1 Minnie Mouse charm. 2 925 silver Minnie Mouse beads. Silver chain. Crafted and encrusted by genuine crystal rhinestones . Lead free, cadmium free, and nickel free . Lead free, cadmium free, and nickel free . Handcrafted from high quality materials . Pave Diamond Bangle. Pave Diamond Jewelry. Pave Diamond Bead Ball. Polki Diamond Bangle. Diamond Wedding Bangle. Wide Cuff Bangle. Rose Cut Diamond Bead. Diamond Palm Bracelet. 925 STERLING SILVER FILLED OR SILVER FILLED JEWELLERY 925 Sterling Silver Filled or Silver Filled are layered silver products that are constructed of two or three layers. Our 925 Sterling Silver Filled or Silver Filled products contain a minimum of 10% or 1/10 of silver by weight. 1 Elsa charm. 8 large multi colored blue beads. Only 5/5 is ok with them. if you can't do that for any good reason, let us know. 1 Anna charm. 8" Pandora blue leather chain. 8 large multi colored blue beads. 2 small crystal blue beads.